Feel free to contact us when considering temperature-controlled short-time transportation (approximately 4 hours). We principally offer transportation of fresh bread at 20°C (normal temperature = constant temperature) using refrigerating and warming devices regardless of outside temperature (from sub-freezing winter temperature to scorching summer temperature). We mainly perform our transport twice per day during the four hours between midnight and noon. We are offering to help you with transport outside these hours this time. 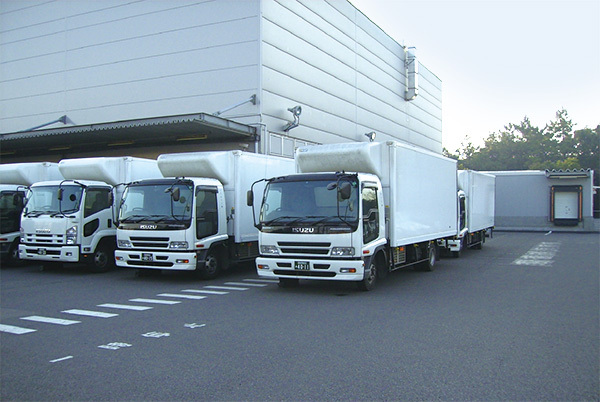 - Four 4t trucks with tail lift and controlled temperature between -5 to 30°C. - Ten 4t trucks with controlled temperature between -5 to 30°C.